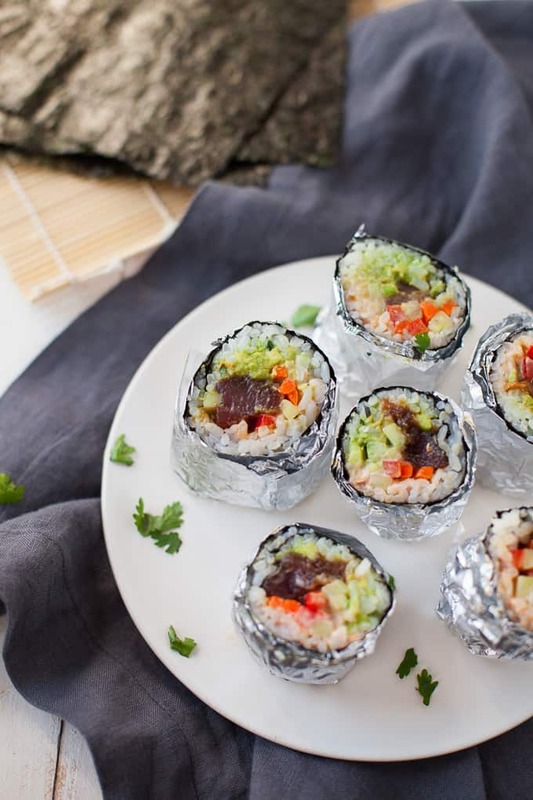 These mini tuna sushi burritos are the cutest appetizers to serve at your next get-together! Not to mention, they’re pretty delicious too. I remember my first sushi burrito like it was yesterday. It was a few years ago in California (of course, it was California – all the best food trends start there). And I was like this is genius. The version I ate that day had all the sushi components wrapped up in a tortilla but most versions I see these days are wrapped in seaweed or nori. Which, if you think about it a sushi burrito is basically like one big (and better) sushi roll. Not sure what I mean? 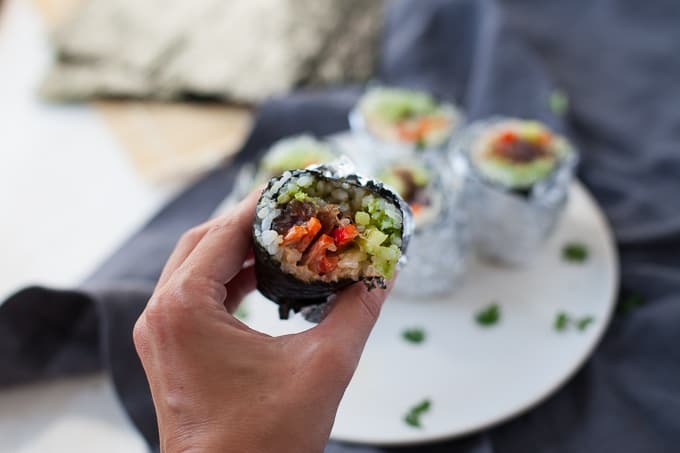 Watch my video for how to make these mini sushi burritos below! I honestly think one of the reasons I like sushi burritos so much is because they usually contain guacamole (a play on burritos but it works bc avocado + sushi is delish). And they actually feel substantial. Sometimes, I’ll eat a sushi roll and be like that was nice, but I want like four more. But with a sushi burrito, I feel comfortably satisfied afterwards and it carries me over until my next meal or snack. Plus, I can pack a sushi burrito with…seafood! And what better time to eat seafood than National Seafood Month. That’s right, October is National Seafood Month – the perfect time to work towards getting the recommended 2 servings of seafood per week. 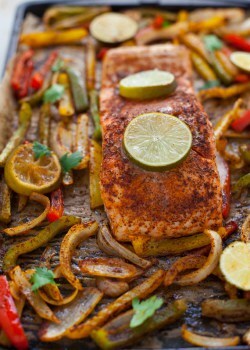 Studies show that eating at least 2 servings of fish per week may reduce your risk of heart disease. That’s because seafood is packed with nutrients like heart-healthy omega-3s! 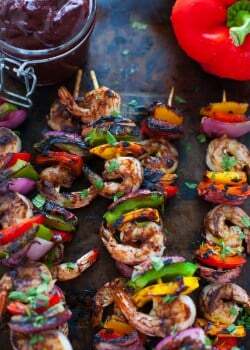 Plus, I love seafood for its versatility. Not only are there so many varieties to choose from but the flavor combinations are endless so you’ll never get bored. In just the last week, I’ve eaten miso-glazed cod, sole with lemon and rosemary, black sea bass with chilies, and salmon with fajita seasoning. Seafood will fit with all your favorite flavors. For all these reasons and more, I’m excited to be partnering with the Seafood Nutrition Partnership to host the Start With Seafood Recipe Contest for registered dietitian, food and healthy lifestyle bloggers. We’re asking bloggers to join the #SeafoodParty and create their own unique seafood appetizer recipes. For the chance to enter to win $1,000 grand prize and two $500 runner-up prizes! For more information about the recipe contest, visit Seafood Nutrition Partnership. 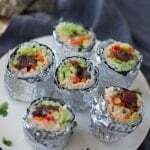 For my appetizer recipe, I took my love of the satiating sushi burrito and turned them into mini sushi burritos. They’re way more fun than your average sushi roll and more satisfying. 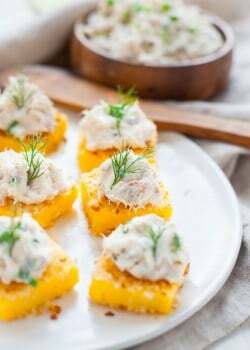 Because like I said in my post for Smoked Trout Polenta Bites, the worst feeling is being hangry at a party because they didn’t serve any apps with protein and staying power! 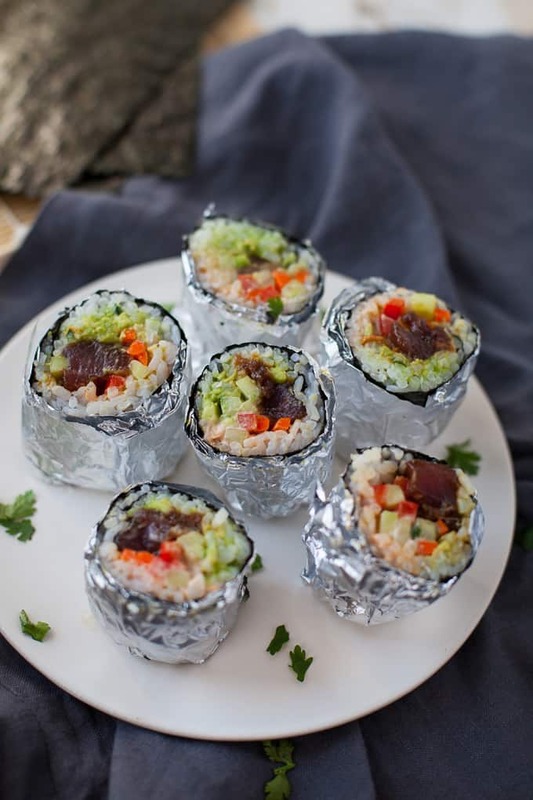 Try these mini tuna sushi burritos at your next party in honor of National Seafood Month! Place rice and 2 cups water into a medium saucepan over high heat and bring to boil. Reduce heat, cover and let simmer for 15 minutes. Remove from heat and let stand, covered, for about 10 minutes. Meanwhile, in a small bowl, combine rice vinegar, sugar and salt. Heat in small saucepan over low heat or in microwave for 30-60 seconds, or until sugar and salt have dissolved. Transfer cooked rice into a large glass or wooden bowl and add vinegar mixture. Fold thoroughly to evenly coat rice and help it dry. In a small bowl, whisk together Greek yogurt, mayonnaise and Sriracha until combined. Set aside. In a small bowl, mash avocado with a fork until creamy. Add lime juice, cilantro and salt until combined. Set aside. In a medium bowl, whisk together ginger, garlic, sesame oil, soy sauce and green onion until combined. Add tuna and let marinade in refrigerator for 20-30 minutes. To assemble burritos, lay a sushi mat on your surface. Lay a sheet of nori shiny-side down and spread about 1 cup rice down in an even layer, leaving 2-inch border on all edges (keep a small bowl of water beside you to wet your fingers while gently spreading the rice over the nori). Spread 2 tablespoons guacamole across half of rice. Spread 1 tablespoon spicy mayo across other half. Lay down a row of tuna and a row of vegetables. 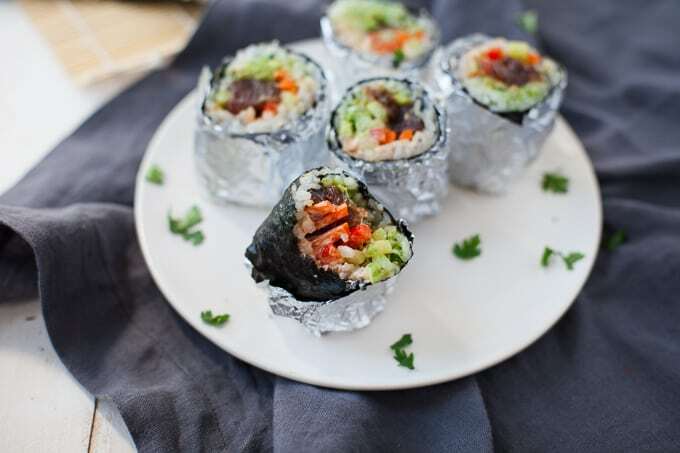 Roll sushi burrito up from the bottom, using your fingers to keep fillings in place. Watch video above for rolling technique. Wrap burrito in foil and cut into four sections. Repeat with remaining ingredients. Serve immediately or store in refrigerator until ready to serve. For other National Seafood Month inspo, check out my recipes below! These look like they are so much fun to make! There are adorable and they sound delicious! Can’t wait to try this fun recipe! Love this idea! I’m definitely going to have to try these! These look amazing! I love how you made the typical spicy tuna roll (my favorite) into a healthier version by using greek yogurt! I want these sooooo badly!!! These are totally gorgeous! Love the idea of making sushi in my own kitchen!